The ubiquitousness of the monstera leaf shows no sign of abating with its popularity extending even to the creation of this functional serving plastic spoon by Elinor Portnoy. Who says lawyers and bankers can’t be creative? Alain Gilles is an ex-banker who left the industry to study industrial design and has opened a product design studio making furniture including this the Frame sideboard which was designed for Italian manufacturer Bonaldo. 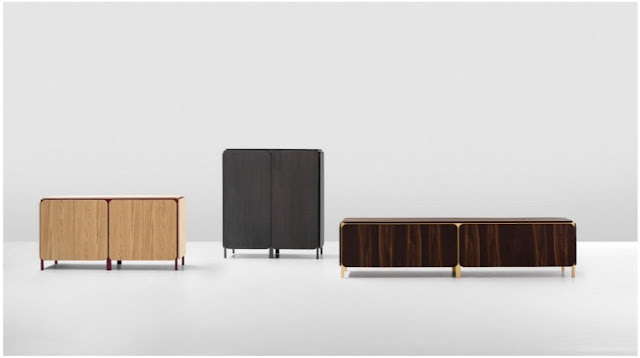 It’s a simple, refined piece based on an angular metal frame on which doors and panels with rounded edges have been affixed. The frame shows in the gap between the panels and reveals the structure of the object thereby creating a dialogue between the different materials used to build the object including metal, wood, and marble. 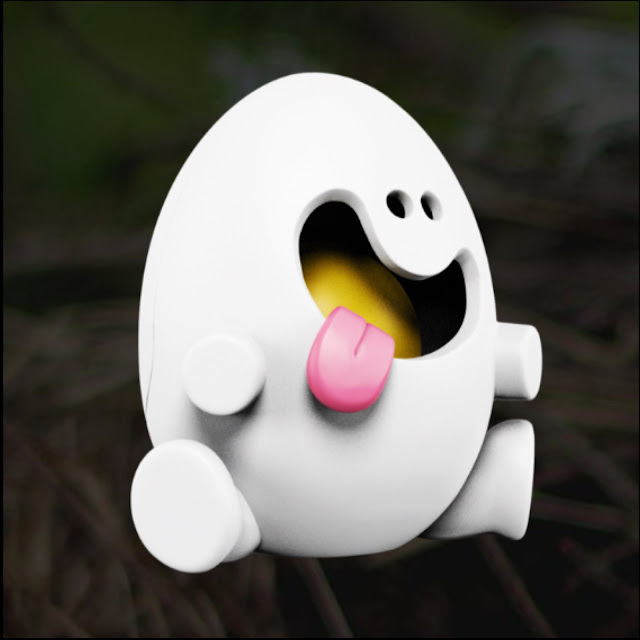 With its punny name, Yolkels by artist, sculptor and illustrator Jason Freeny is and adorable two-in-one toy sculpture. It is designed with a detachable external shell which houses a baby Yolkel complete with pink pacifier in his mouth. The beauty of the Shuttle stool - which vaguely resembles a badminton shuttlecock - extends to the ease with which it can be customised. 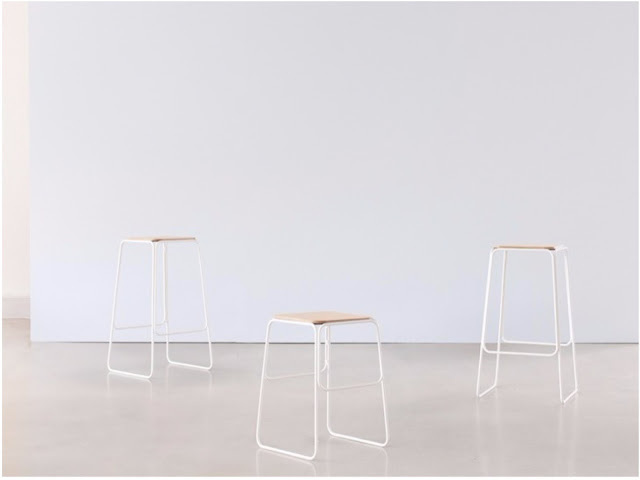 As with the Skirt table from NOMI and award-winning designer Tomek Archer which we wrote about here, the Shuttle stool is also designed to be customisable. 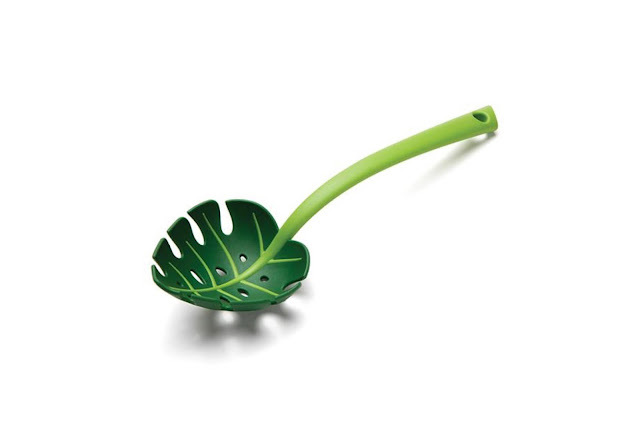 It is constructed from precise formed wire and features radial corners which give a soft, rounded aesthetic. It is stackable and can be produced in a number of different heights. The slender seat is lightweight but durable and this makes it ideal for hospitality, corporate and residential projects. Olivier Lapidus’ sophomore collection for Lanvin was streamlined and sophisticated. This effortlessly elegant show featured some colour-blocking, but always was always grounded in black or jewel-toned colours. Simple, brightly-coloured leather satchels showed off the looks. Anrealage’s collection was all about light and its diffusion. Entitled ‘Prism’, designer Kunihiko Morinaga noted that what the onlooker would take from the clothes would be dependent on their vantage point and played this effect to the hilt. The small collection was notable for its use of unconventional and innovative fabrics. Morinaga emphasised a triangular, prismatic pattern over which transparent PVC macs designed to reveal rather than conceal were worn. This bright pattern then gave way to some interesting monochromatic houndstooth on a stiff, papery fabric. The models wore sneakers which were a collaboration between Anrealage and Onitsuka Tiger. The shoes were coated with a multi-ocular lens effect, ensuring a reflective surface from head to toe. 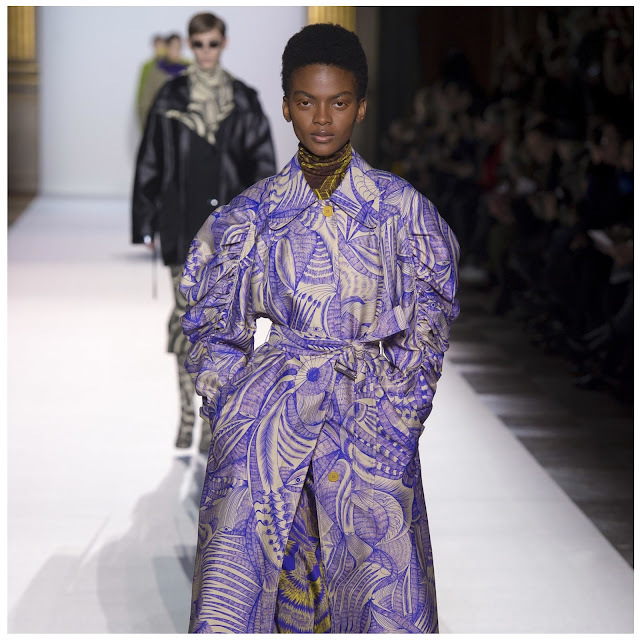 Dries van Noten showed a huge collection of 74 wildly patterned but sophisticated pieces. The hand drawn pattern was lifted from his theme of ‘Art Brut’ or outsider art. The collection consisted of sharply constructed suits and separates many with voluminous sleeves. Most lengths hit the calf and there were pretty, flowing silk coat dresses. The models also wore coats with thick, heavy collars and were swathed in fur. Trim was affixed at a diagonal. How very prescient of John Galliano. In a week which saw most of Europe blanketed by snow and reeling from harsh winter weather, the models at Maison Margiela were more than prepared to face whatever the elements could throw at them. 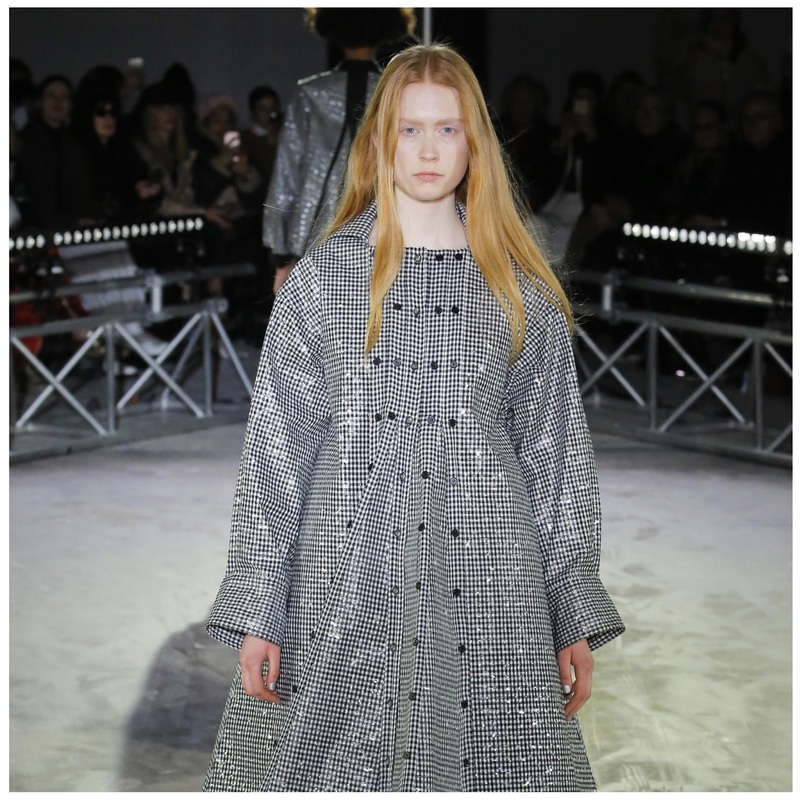 Here, the focus was mainly on outerwear and the models were swathed in plastics and technical fabrics. Anoraks, cagoules and deconstructed trench coats were designed to envelope their bodies and protect them from the elements. Hats were pulled low and sweaters pulled high. In addition to the plastic caplets, there was an unusual use of asymmetry with the use of a one-armed sleeve warmer. Euro excess from Versace Versus with this collection that paid respect to its past but kept a firm eye on the present. The archive was trawled to reintroduce the house's original logo, which was then combined with an iconic monochromatic checkerboard Damier. This print was updated by combining it with botanical imagery and this added a freshness to the clothes. A fun and whimsical collection from Mulberry where creative director Johnny Coca took inspiration from floral wallpaper prints. 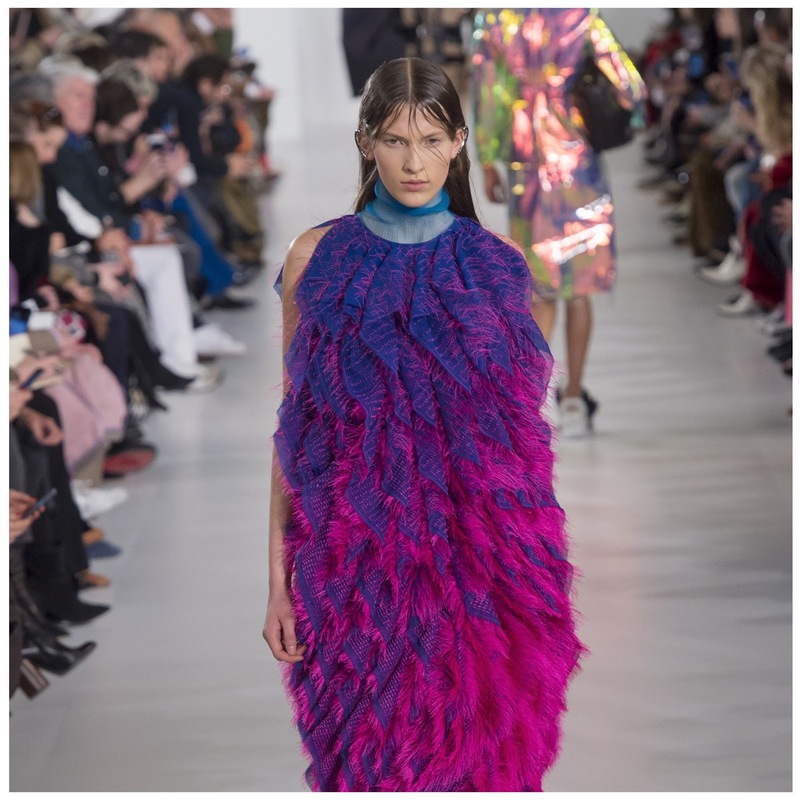 The long, narrowly cut dresses and separates were given a lighthearted feel with bright colours and quirky marabou trim. 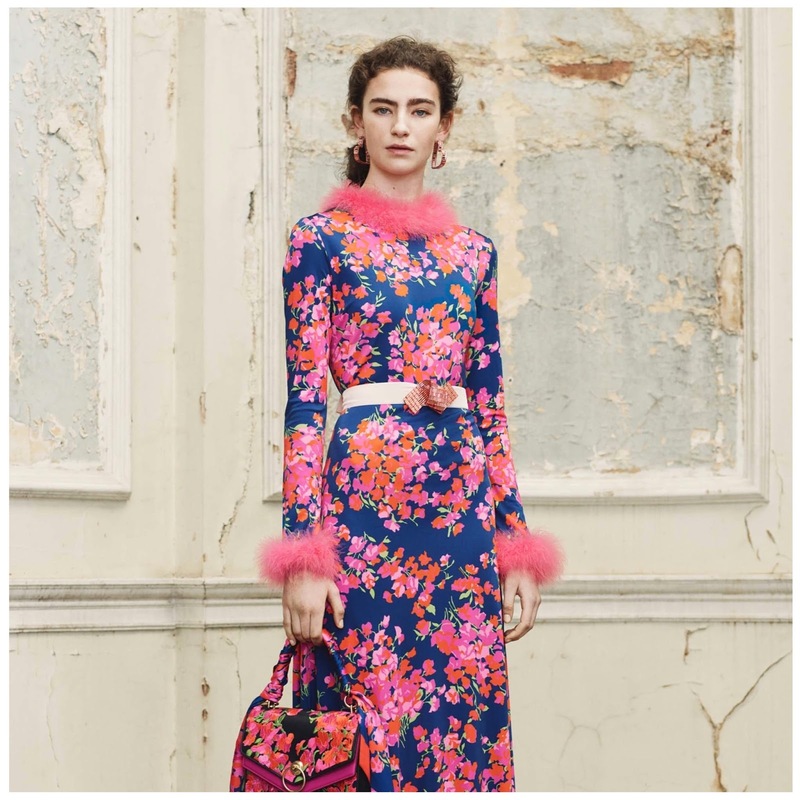 The clothes were notably accessorised by bags including new versions of Mulberry's Amberley bag. 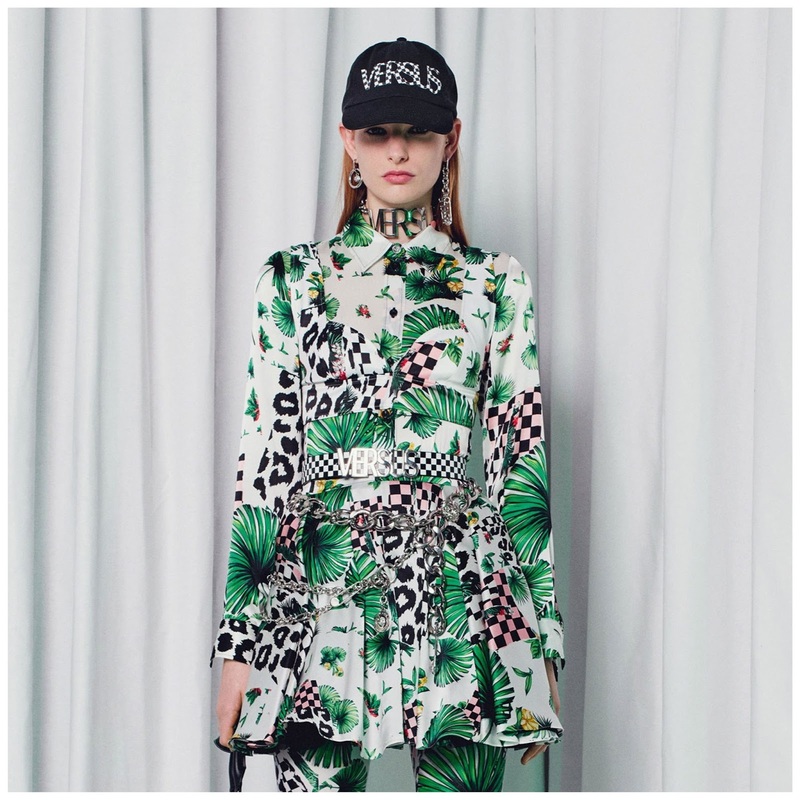 Karl Lagerfeld and Silvia Venturi created a collection for a strong woman. 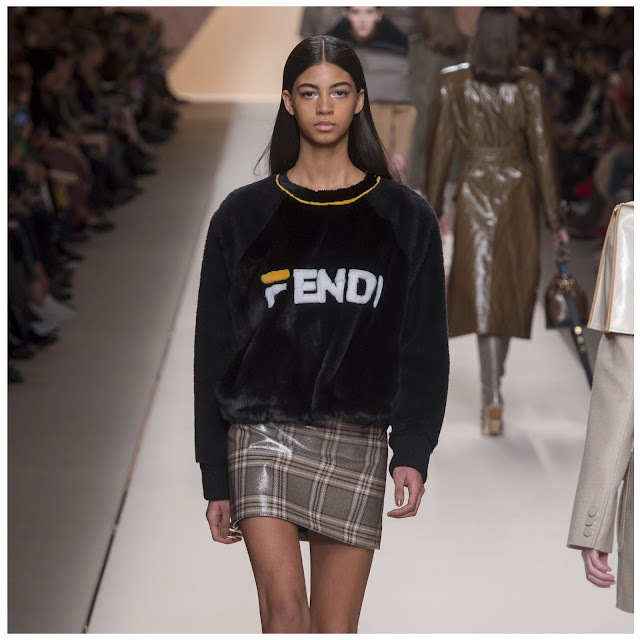 Logo heavy (the double F logo in a beige brown was thrown on practically everything), Fendi’s coat game was strong. There were padded and patent capelets and sleek, smart suiting was evident. Skirts were inlaid with animal skin, plaids or featured inverted pleats. The clothes were squared at the shoulder giving an overall lean but boxy silhouette which was bisected across the chest. The looks were completed with gorgeous bags and boots.